Cucumbers are one of the most popular plants for home vegetable gardening. They are easy to grow, produce all season long, and are high in nutritional value. 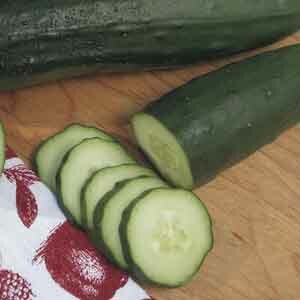 There are two main types of cucumbers; slicing types and pickling types. Slicing types are best for eating fresh. Grow these for use on salads, sandwiches and relish trays. Pickling cucumbers are small and well suited for making home canned pickles. Cucumber plants usually vine and require space to spread out. For those with limited space, look for hybrids with a bush habit. Bush varieties are smaller and can even be grown in containers. Eat fresh for a delicious and nutritious snack. Slice into salads, or toss with vinegar, onion and seasoning. Serve with dip on a vegetable tray. Wash fruits, vegetables and herbs thoroughly before eating. Plant in a sunny location after the threat of frost has passed. Space 2-3 plants in hills 4-5' (1.2-1.5m) apart. Water freely in dry weather. Pick fruit often for the highest yield.